Just to let you know that the Clearance Rack has just been updated... NEW retired items added at up to 60% off. Items do sell out really quickly so please shop now to avoid disappointment! Lots that I know will be of interest but a couple less obvious ones to point out Festive Piercing Pack (I know a lot of you have got matching Framelits!!) and Watercolor Winter card kit...20 cards for £9.19...bargain!! And look at all those punches! And if that is not enough... there are 11 items on Weekly Deals this week. 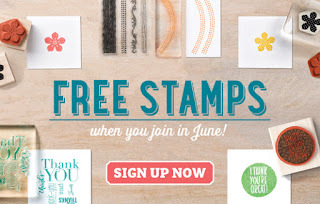 Last day for 2 extra free stamp sets when you join Stampin' Up! 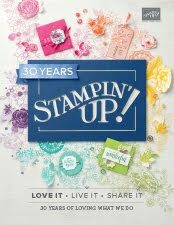 Today is the last day you can choose the extra 2 stamp sets for free when you choose to join Stampin’ Up! So not only can you choose any products up to a value of £130… but you can add any 2 stamp sets – for FREE. Any 2 stamp sets of any value from the BRAND NEW 2015-16 Annual Catalogue. And you still pay just £99. I think this is the best offer I have ever seen in my 7 years with Stampin' Up! A huge welcome to the team for those of you that have already joined this month... and for those of you thinking about it a bit more... here is my sign up link.... or please just contact me for more information.... no obligation at all! If you are thinking about it...please do not wait any longer!? Come and have some fun & crafty time with the Team! This deal is only available till 10.59pm Tuesday 30th June. Work of Art ... Tractor. And a Public Warning!! Again a true CAS card just to show you the concept... Any further additions would have used up all my time & stopped me from sharing ( says the voice of experience!) ...so I thought it better to just mount it, photo it & blog it! I am glad I found these though...as they reminded me how much fun I had when I opened the Work of Art stamp set for that first time. I reckon that everyone has their own unique Work of Art ...what will yours be? Remember that the Work of Art stamp set RRP£20 is only available at the £15 discounted price until 11pm tomorrow night (Tuesday)... but I wouldn't leave it until after 10.30pm to order....! And my Public Warning... well... 11.01pm UK time tomorrow will bring us the new Weekly Deals... and SU! tell us that there will be more of them than the usual 8... with discounts up to 30%. But also that once the allocated stock is gone...then the item will revert back to full price! Work of Art... Choo Choo Train!? Seeing as the stamp set is on Weekly Deals this week... 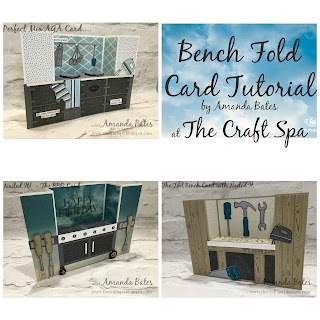 I just had to find this one to share with you... a true concept card... made a while ago... kept meaning to re-make as it was just created on a random piece of white card at the time... so today was the day to just add a couple of mats, photo and share! A true CAS card! I keep telling you that my creative side works in the most mysterious of ways! Do try the new Fast Fuse adhesive... runner type glue but nearly as strong as Sticky Strip/red line tape.... easy peasy! 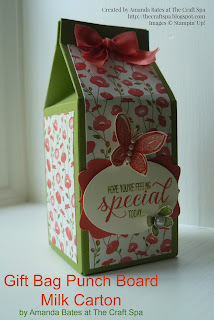 Here is the card that inspired the Gift Bag project I shared yesterday. And oops - I have just realised that I have forgotten to add my embellishments - there are metal rimmed pearls and a few gold sequins laying in my craft room just waiting to be popped on!! I'll add them and re-share the dressed up version another day!!! Just popping on to share another make from our Quarterly Training last week. Oh and finally... an update or two on me! Just inked direct with an ink pad around the mat and banner edges...and used the debossed butterflies side rather than the embossed side. And here are my set of 4 cards... although I am now laughing at myself - the 2nd set of butterflies were meant to be in blues... Pool Party, Bermuda Bay and Island Indigo - so how come I ended up with Mint Macaron & Lost Lagoon butterflies!! 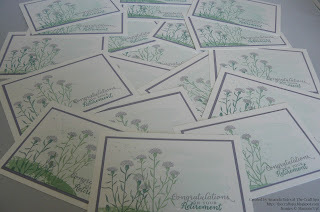 Oops - they were meant for another 2 cards we made.... oh well off to stamp more butterflies then!!! Kept a couple of my training makes back for a quick but simple step up for my girls! I used the Brick Wall embossing folder again - but this time I swooshed it (yes official term now!) very lightly with a Sahara Sand ink pad before I embossed the card.... Then I lightly sponged around the edges with Sahara Sand too.... Fabulous texture! And a Lost Lagoon greeting on the banner & a few pearls just to liven things up a bit! 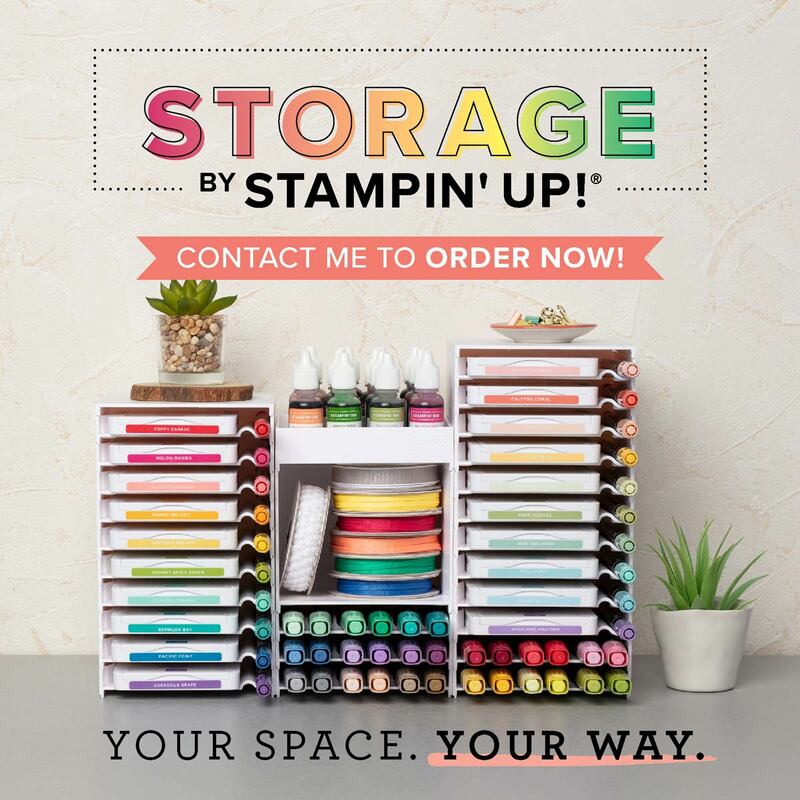 Stampin' Up have provided us with 2 great new products that let us make cake without any fear of the calories.... yes... you can have your cake and "eat" it! Create a sweet addition to a birthday bash, wedding gathering, or welcoming party for baby and send your guests home with a favor. 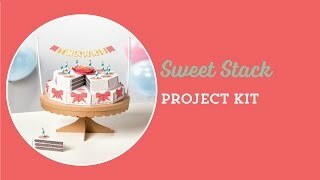 The Sweet Stack project kit makes a two-tier cake, with enough cake box favors for 20 guests. 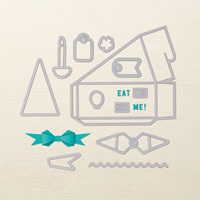 Complete the kit using the Sweet Stack Stamp Set (item 138948). Stamps, ink, and adhesive sold separately. Instructions included. Make die-cut boxes for individual treats, or create a whole cake! 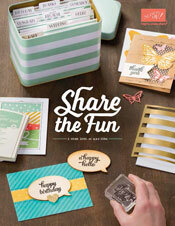 Cut out these boxes in record time with Thinlits dies and the Big Shot. Thinlits Dies help you create detailed die-cuts with just a few turns of the Big Shot handle. * Finished box size: 2-3/4" x 4-1/4" x 2"
You will regret neither...and you will probably end up with both...which is great as they both co-ordinate really well with each other! Both use the Watercolour Wings stamp set, the fabulous new Thank Yous greeting set, One Big Meaning and the new Triple Banner Punch for the banner. The first uses the new Fluttering embossing folder and the second the Brick Wall embossing folder. Great thing about these folders - is that they are 6" square..... so I can emboss a whole large square card in one go... thank you Stampin' Up! Not only does the GBPB make great bags very easily... but it also adds something unique in the making of other projects - making it a complete must have in my book!! So in my usual style.... I haven't made many bags... instead I have been playing around and using it to produce some old faithful crafty friends. Oh and I have used my brand new stamp set, Garden in Bloom that I won in the Team Training Raffle on Saturday... I love this sentiment and these butterflies are so cute! Right that is it for today... after I blogged yesterday we decided to go to A&E with my cut up finger - so I am now the proud owner of the largest finger bandage you have ever seen!!! All will soon be well - but I won't be making anything fast this week! Well... 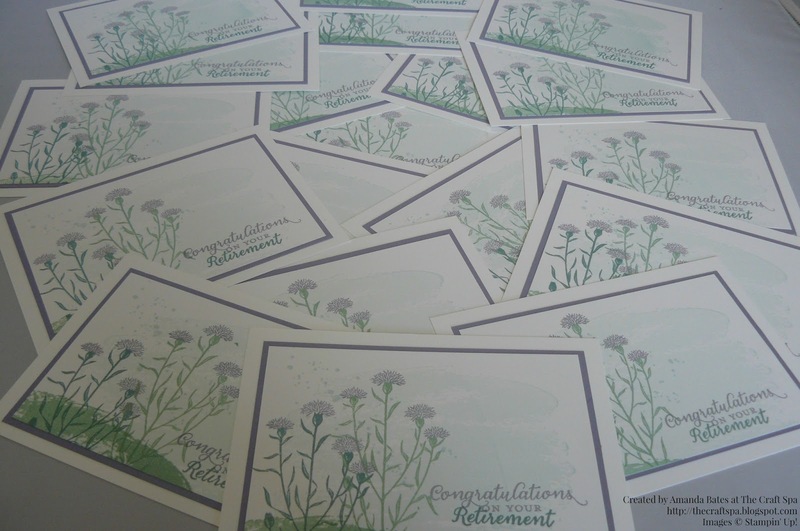 I was just enjoying playing around with the concept & the thistles in order to produce my Team Training swap card.... hope I know lots of people retiring this year! The wording in this set is great - I may have a lot of words in stamp form - but there are some great new and useful ones in here. Going to be a quick share today... and probably for the next few days... as unfortunately I had a self-inflicted accident yesterday involving my big scissors and the very tip of my finger! All in the pursuit of my craft..... I won't go into more detail...wasn't nice at the time!!! But could have been a whole lot worse... panic not!! I am off to our Team Quarterly Training today. A day I always look forward to… as we get to make a lot, be inspired a lot and usually laugh a lot too… all in the company of a great bunch of ladies that I am definitely proud to call my stampin’ friends! Today will be extra special as we get to use new things from the new catalogue! Always exciting for us demos – no matter how long we have been a demo for! I still get just as excited and inspired after nearly 7 years of doing this! We always have a swap too – where we make one card design for every person in the room. And we swap our cards with each other… so we come home with a bag full of 20 or so projects for our displays (or just to send to friends & family if you don't do events) - using different new stamps & products – as well as different technique and styles. I then sit at night and go through oohing and aahing at everyone’s lovely makes – talented bunch that we all are! So this is my card swap design this time. 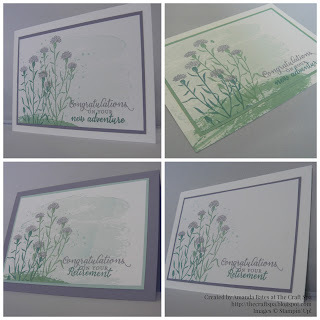 A simple card highlighting 2 new stamp sets – Watercolor Wash and Wild About Flowers. On a Thick Whisper White card base of course. 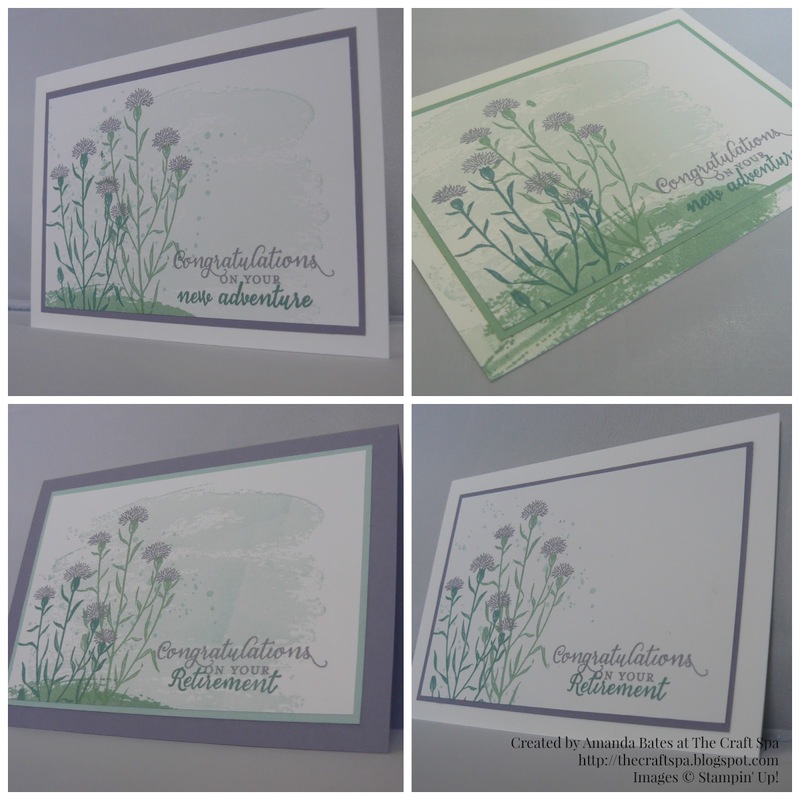 And of course my favourite colour combination of the NEW Mint Macaron, Soft Sky & Lost Lagoon – along with Wisteria Wonder as I thought that the best colour for this thistle type image…. Love this flower image – I have to admit that I have a thing about thistles!! Do you fancy joining us at our next Quarterly Training Day in September? Corner Garden - and a Tip!